World-renowned environmentalist and social justice advocate. A prominent environmental speaker global authority on sustainable farming and agribusiness. She's been nominated for the Nobel Peace Prize. 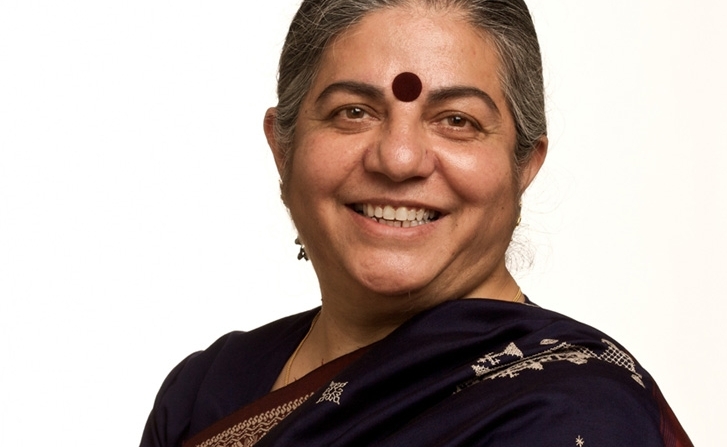 ​Vandana Shiva is one of the world's most respected environmental activists and feminists. A trained physicist, she received her PhD. at the University of Western Ontario, and since the 1970s, has been a vocal figure in the conservation movement. A leader in the International Forum on Globalization (IFG) along with Ralph Nader and Jeremy Rifkin, Vandana Shiva fights actively for changing practices in agriculture and the way humans view food. Emphasizing the need for sustainable agriculture, she is an opponent of genetic engineering, and a supporter of getting women across the globe more involved in planting and farming. In fact, in 1993, Shiva received the Right Livelihood Award (often known as the Alternative Nobel Peace Prize) for her work "placing women and ecology at the heart of modern development discourse." Vandana Shiva is also the recipient of the United Nations Environment Programme's Global 500 Award and the Earth Day International Award of the United Nations. Also the author of many books, including Earth Democracy: Justice, Sustainability, and Peace and Manifestos on the Future of Food & Seed, Vandana Shiva is a unique environmental speaker with impact. Her knowledge and depth of experience in the global environmental sustainability movement have helped change the world, and create a better future for us all. Her most recent book, Making Peace with the Earth, Shiva demolishes the myths propagated by corporate globalization in its pursuit of profit and power and shows its devastating environmental impact.